When thinking of designing a dream home, many people think first of the inside floor plan- how they will design their kitchen, master bathroom and family great room. While the inside of your dream home is of the utmost importance, it is essential that you do not neglect your exterior. What Style Bath Do You Prefer? Over the last several years the bathroom has been transformed from a small room, simply designed for necessity to a luxurious escape. Many homeowners choose to have large bathrooms with high end features and elegant lighting. Welcome to the Frusterio Design blog. 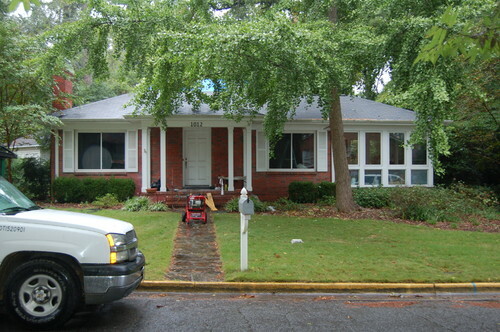 Today we would love to show you some before and after photos of one of our favorite remodels in Homewood, Alabama. This home was completely transformed into a lovely mix of tudor and modern styles. We hope you enjoy these photos! Happy Monday, everyone! We would like to ask you a simple question today. Have you seen our Houzz page? Recently we have been making updates to our profile and adding new projects to our portfolio. We would love for you to stop in. Let us know what you think!